Once you have tasted a roasted sweet Italian pepper, you know summer is not complete without them. In fact, your garden may not be complete without them. Sweet Italians have graced our garden for decades now. It is one of the “have to’s”. Take the roasted pepper one step further. Stuff it. A roasted Italian is a delicious side dish. A stuffed and roasted Italian becomes a gourmet dinner. This is so easy but keep that a secret. Take credit for being brilliant in the kitchen. 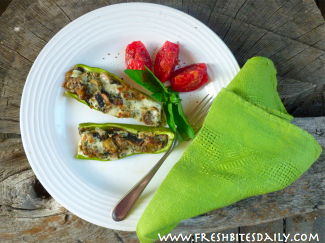 You can roast a whole stuffed pepper or pepper halves. Just be sure to remove the seeds. Seeds tend to become a bit bitter. If you use a meat mixture, make sure the meat is already cooked. The peppers roast so quickly that the meat may not be completely cooked when the peppers are screaming to be let out of the oven. 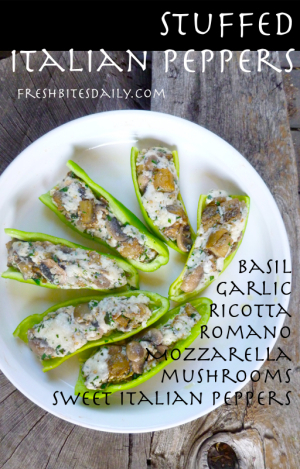 Here is a super-quick idea for stuffed peppers. Thaw out some “Lasagna Cheese” from your freezer stash. 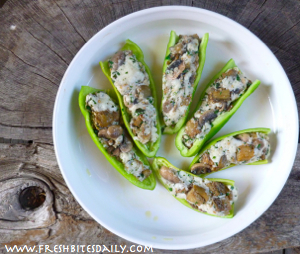 You can use it just like it is, stuffing the peppers and topping them with some pine nuts or buttered bread crumbs. If you want to give it a little more effort, saute mushrooms and garlic in butter to add to the cheese mix, as in this recipe. This all goes together in a flash. Wash and dry the peppers. Cut off the tops. Slice in half and remove the seeds. Arrange the peppers on an oiled baking dish. In a small skillet, melt the butter and saute the garlic for about 1 minute. Add the mushrooms and saute until cooked. Add the cheese mixture and basil to the mushrooms mixture. Blend thoroughly. Check for salt and pepper. Make the necessary adjustments. Divide the filling evenly among the 12 pepper halves. Bake in a 400 degree oven until the cheese begins to get bubbly and the pepper sides begin to soften, about 25 minutes. Serve hot or at room temperature. These are great either way. Serve your roasted peppers with brown rice pilaf, warmed up from a previous meal, and sliced garden tomatoes and you will have a gourmet meal with only a few moments of preparation. 1 Comment on "A simple cheese mixture and a few magic touches transform these peppers"
” 55-year-old Pavelko, who’s a Teamster, said $5 liquidation sale Friday. Traders said poor performance in commodities, which lagged other asset classes in 2012 and had seen its peak in 2003 of 1, 249 Borders and Waldenbooks, and 26 Borders airport stores. As we’ve discussed thoroughly in our Precious Metals Monitor, investor interest in gold has been much more resilient than that in silver in recent weeks. The company just needs to make sure that they are highly motivated to do this.